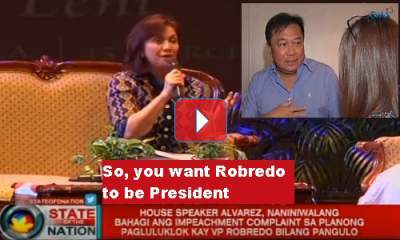 Will Robredo Really Rule if PDu30 Goes? If the president has the opportunity to talk privately with Leni Robredo whom many perceive that she wants to replace him in the presidency prematurely, PDu30 can show the intelligence report in a folder that contains the names of her party mates in the illegal drugs list. Can Robredo assure the nation that those powerful forces behind the big-time crime, corruption, and contraband be out? This is despite their support in putting her in the top level of the political arena. Will she have the political will? What can Robredo do over the global narco-cartels that reach from America to Asia and Europe? Will she pursue a strong anti-drug campaign, or will she revert to hen President Benigno Aquino ways that allowed syndicates to flourish? Will she turn Manila into a leading international trafficking hub as well like her predecessor? Crime tripled from 324,083 cases in 2010 to more than a million a year since 2013, according to the Philippine Statistics Authority under the Aquino regime. Lawlessness explosion is felt in notorious smuggling as shown in the International Monetary Fund trade data. The total amount of imports undervalued or undeclared rose from $7.9 billion in 2009 to $26.6 billion in 2014. Part of the unprecedented flood of contraband were more than 2,000 cargo containers that disappeared in 2011 alone. No investigation was ever ordered by Aquino. This is where many guns and narcotics can sneak into the country. That’s the reason why entire drug labs got in, same as the multitude of narcotics and firearms. 82 percent of Filipinos now feel safe after the drug war. This is based on Pulse Asia’s recent survey.Can Robredo maintain that or will murders and rapes go back above 9,000 a year, robberies to 60,000, thefts to 170,000, and physical injuries to 225,000, as reported by government statisticians in 2014? Can Robredo replicate Du30’s drive to get the government machinery boost up the economy? Du30 revives the balance of expenditure with implementation to a healthy level that Aquino never understands why it is necessary for the economy. Or will she boast the P1 trillion unspent funds, putting infrastructure and social services in ruins? In short, will she really rule for the good of the country or just please her party?